Potlucks are such an amazingly fun time, but what to bring can be a challenge. Making something with smaller servings that will feed a large crowd can be a challenge if you crazy busy. While there are lots of options now at Costco and in your local grocery store, I still like to try and bring something homemade whenever possible. Rice Noodle and Vegetable Salad with Peanut Dressing and Rainbow Slaw, but sometimes I like to try something new. One time I brought shredded Pork Carnitas meat and tiny mini tortillas (hors d'oeuvre size) to put it in. Another time I brought zesty Chili Lime Chicken Wings. But when I'm busy, there really is no easier choice than cocktail meatballs in a sauce. How much work you want to put into this is up to you. You can buy a LARGE bag of pre-made meatballs from Costco or in Canada at the M&M Meat Shops. If you have the time and the drive (or need a gluten free meatball) - you can also make your own from scratch. The store bought meatballs are usually pre-cooked, but be sure and double check. If so, you can dump them straight in your crockpot, pour in your favourite sauce, put the lid on and turn it on low. I usually prefer to bake them first to remove some of the fat and crisp them up a bit. My original go-to sauce has many version on the internet. It's a combination of Grape Jelly and Heinz Chili Sauce. The proportions vary widely, so you have to find one that suits your taste. It's always been a hit, but like with all recipes, you find yourself occasionally wanting to explore new territory. So for a recent potluck, I found this recipe for meatballs with a Honey Garlic sauce on a site called Family Fresh Meals. I found it a little on the sweet side, BUT it was easy, delicious and received rave reviews at the party. You'll just have to try it and judge for yourself. This recipe can also be served for dinner with (or on) rice. Enjoy! In a medium bowl, mix together brown sugar, honey, ketchup, soy sauce and garlic. 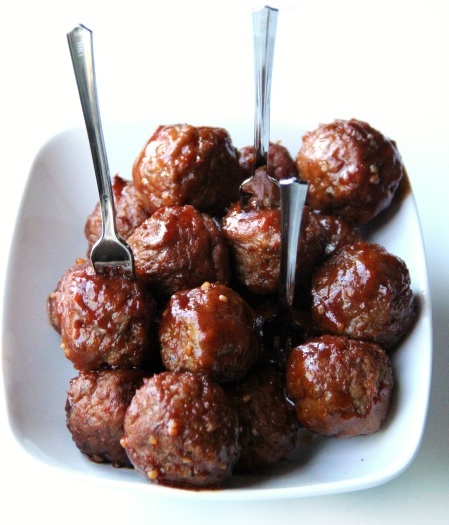 Place frozen meatballs in a 3­ to 4 quart crockpot and pour sauce over meatballs. Stir so all meatballs are coated evenly. Cook on LOW for 4 hours, stirring occasionally.